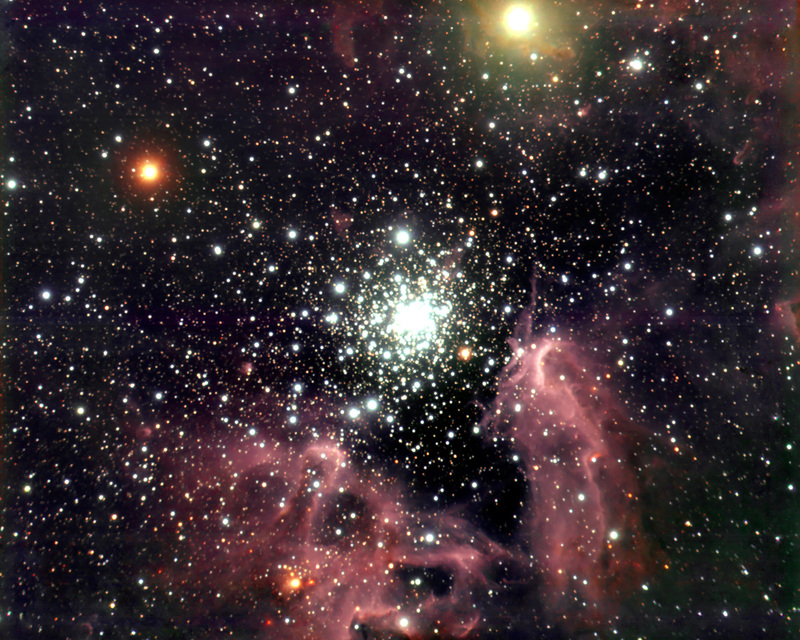 These images of the NGC 3603 region were obtained in three near-IR filter bands (Js, H and Ks) with the ISAAC instrument at the ANTU telescope at the VLT at Paranal. 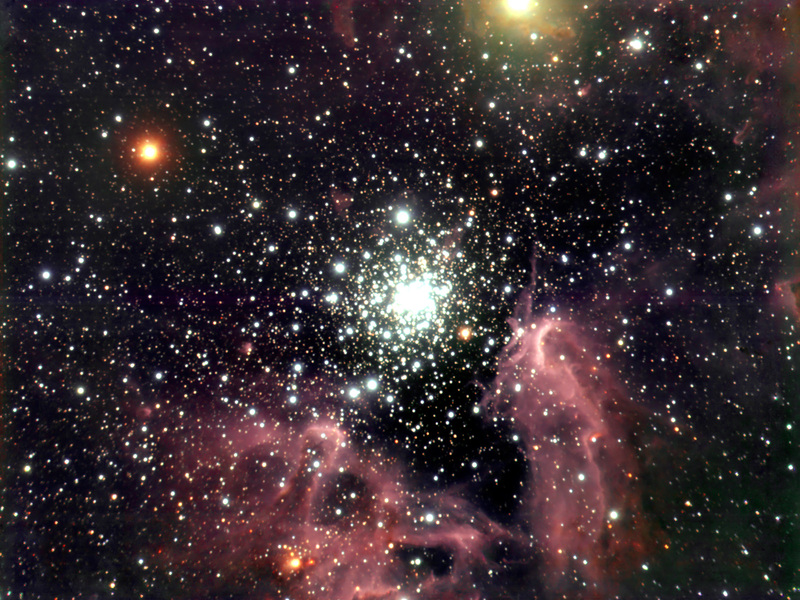 NGC 3603 is located in the Carina spiral arm of the Milky Way galaxy at a distance of about 20,000 light-years (6-7 kpc). It is the only massive, galactic "HII-region" (so denoted by astronomers because part of its hydrogen is ionized) in which a central cluster of strongly UV-radiating stars of types O and B that ionize the nebula can be studied at visual and near-infrared wavelengths. This is because the line-of-sight is reasonably free of dust in this direction; the dimming in near-infrared radiation due to intervening matter between the nebula and us is only about a factor of 2 (compared to 80 in visible light). 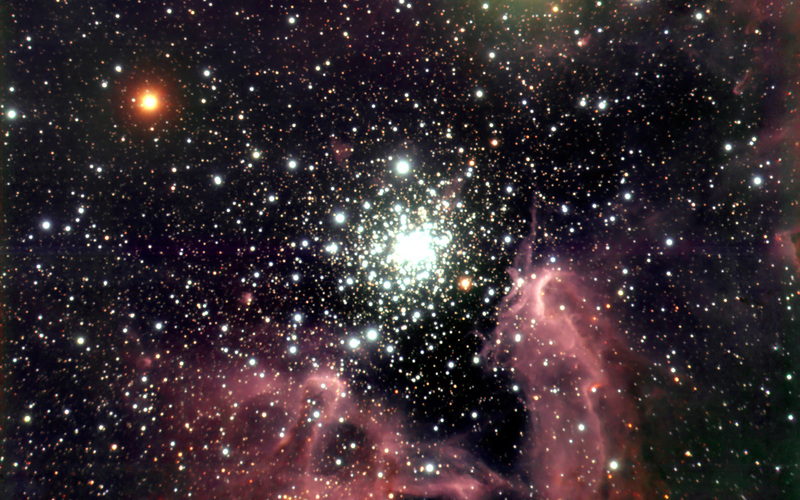 The total mass of the hot O and B stars in NGC 3603 is over 2,000 solar masses. Together, the more than fifty heavy and bright O stars in NGC 3603 have about 100 times the ionizing power of the well-known Trapezium cluster in the Orion Nebula. 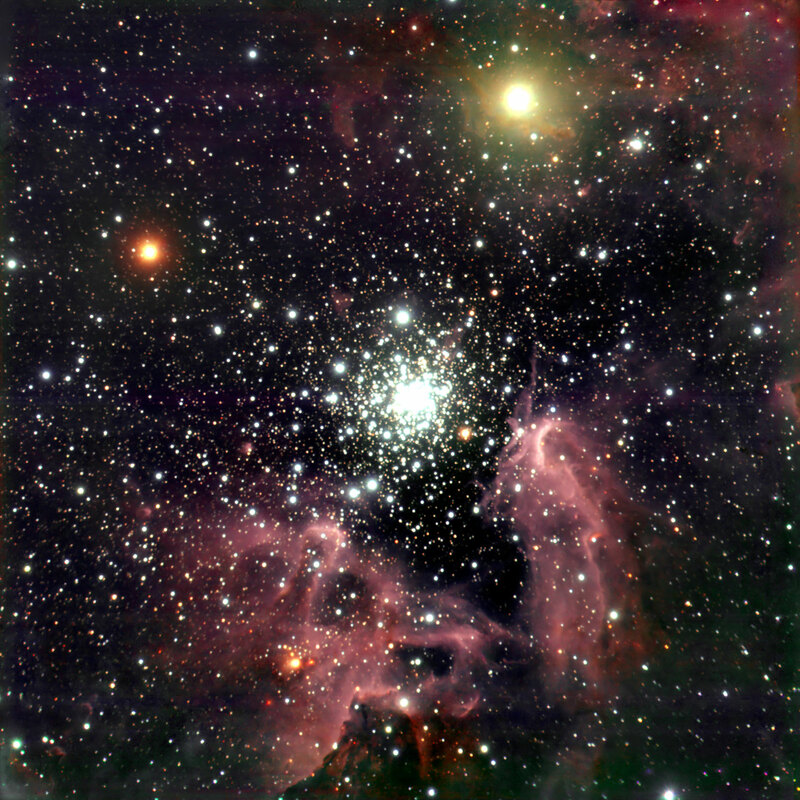 In fact, the star cluster in NGC 3603 is in many respects very similar to the core of the large, ionizing cluster in the approximately eight times more distant Tarantula Nebula in the Large Magellanic Cloud. An important conclusion of studying this region is that there are lots of sub-solar mass stars in NGC 3603. Contrary to several theoretical predictions, these low-mass stars do form in violent starbursts. The overall age of stars in the contraction phase that are located in the innermost region of NGC 3603 was found to be 300 000 to 1 000 000 years. The counts clearly show that this cluster is well populated in sub-solar mass stars. Position (Dec): -61° 16' 11.93"